These flowers were growing in my garden. True to their name, they bloom for just one day and die. 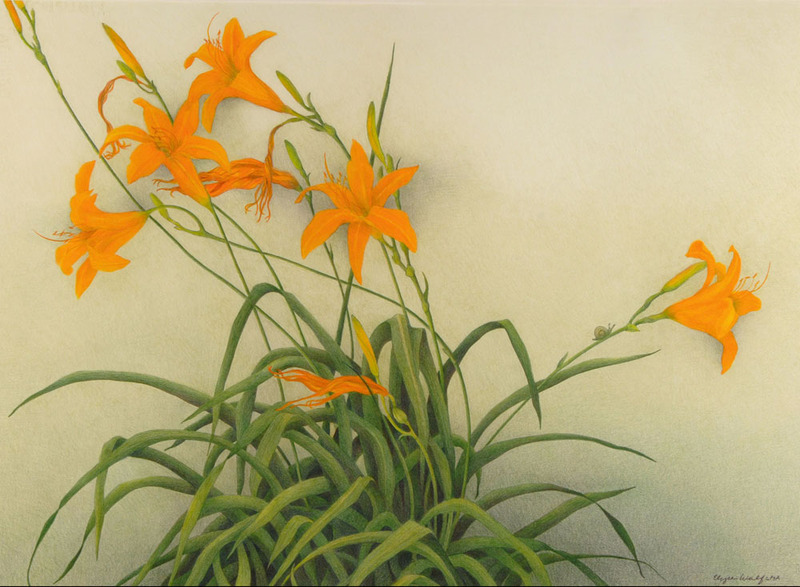 In this drawing, I’ve included every stage of the lily, from bud to faded blossom. The asymmetrical composition and suggestion of mist create a sense of immediacy and capture the ephemeral quality of these flowers. Summer in my garden brings the most delightful experiences and Pride of Barbados is one of the most spectacular flowering plants that can be viewed from my solarium. Its flowers are vibrant yellow, orange, and fiery red. 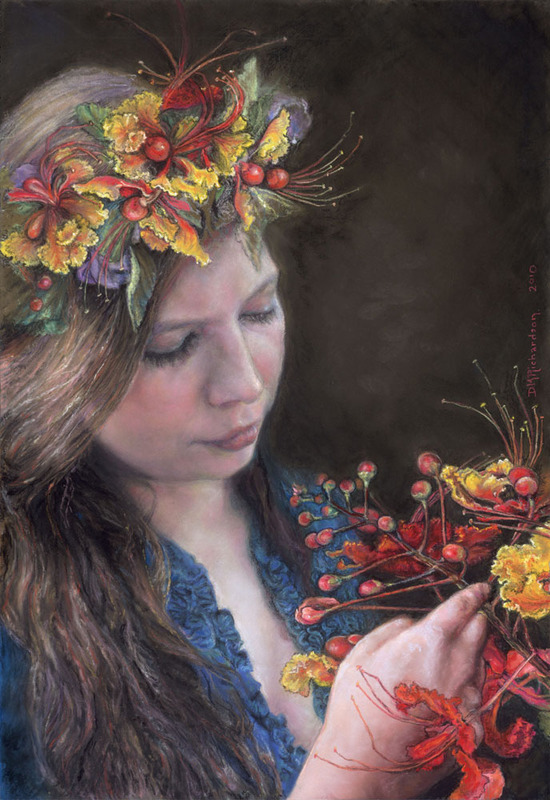 I knew there must be an enchanting way to combine this most spectacular flora and my beloved niece and model, Shasta Chez’ who had just recently renewed her vows. These two exquisite subjects intertwined into the painting ‘Blossoms for the Bride’. As I began to create “Finetuned”, I gathered several of my favorite things. The hydrangea would obviously play center stage, but I knew I needed just the right accompaniments to create an intriguing story. 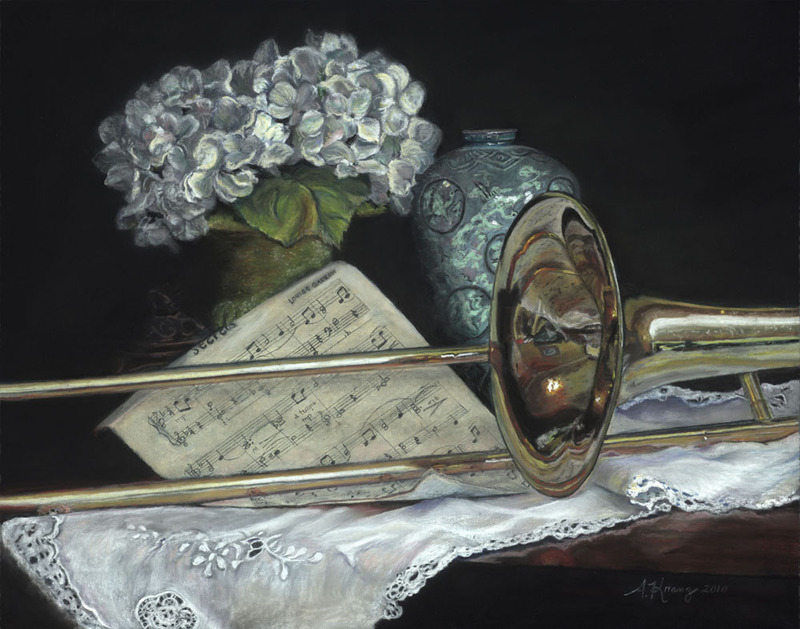 I brought in my son Adam’s trombone – I loved the way it reflected elements of the room – and my favorite piece of sheet music, “Secrets” that I often play on the piano. I rounded out the piece with a celadon vase with its traditional greens and crane design which I had purchased while living in Korea, and then added a Chinese good luck charm. The delicate white lace table runner was given to me by my mother and the wood game table from my dad made the composition complete. This painting grew from objects loved and cherished with warmth and wonderful memories.